You should check disc brakes and disc brake linings every 10,000 miles — more often if your brakes suddenly start to squeal or pull to one side, or if your brake pedal flutters when you step on it. Don’t confuse the fluttering with the normal pulsing of ABS brakes when they’re applied in an emergency stop. Today, most vehicles have four-wheel disc brakes. Others have disc brakes on the front wheels and drum brakes on the rear wheels. When you check your disc brakes, measure the thickness of the linings on the pads so that you can tell whether the linings on your brakes are badly worn. If the lining is down to the thickness of the steel backing plate, the pads should be replaced. Jack up your vehicle and remove a front wheel. Use wheel blocks for safety. 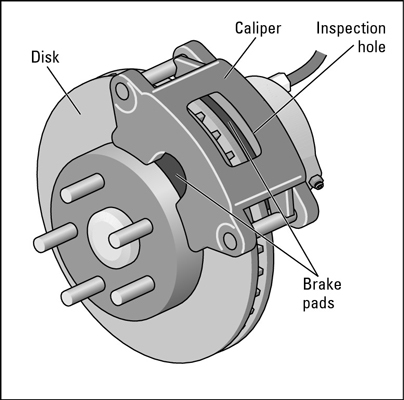 Look at the brake disc (also called a rotor), but don’t attempt to remove it from the vehicle. Relining, caliper maintenance, and disc grinding should be left to a professional unless you do the job under supervision at an auto class.